Dr David Watt (Associate Director) provided consultancy services to Binham Parochial Church Council for works to the Priory Church of St Mary and the Holy Cross at Binham in Norfolk during 2016. The remaining nave of what was a cruciform building with central crossing tower forms the parish church and the remains of the claustral buildings are in the guardianship of English Heritage. The west front of the church dates from between 1226 and 1244 and its window is considered to hold the earliest example of bar tracery in England with brick blocking inserted in 1809. David was involved previously at Binham Priory with the repair and conservation of the gatehouse and precinct walls on behalf of the Norfolk Archaeological Trust and the north aisle on behalf of Binham Parochial Church Council. 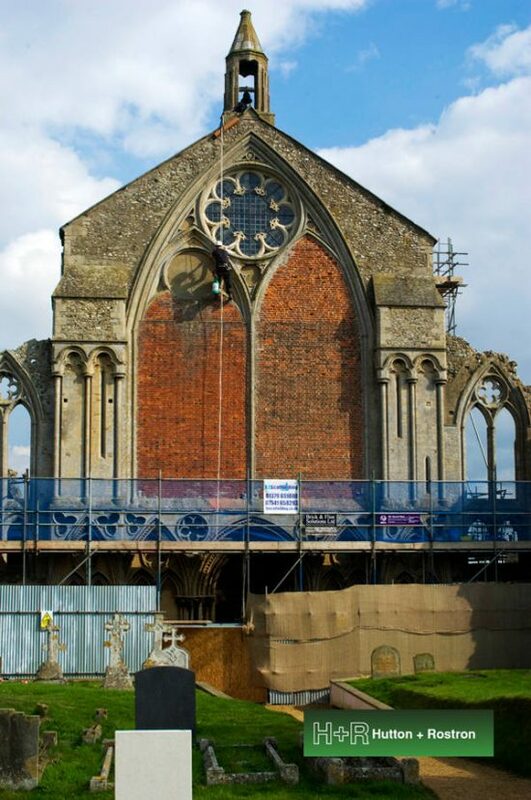 Works to the church this year included the repair of masonry and brick window blocking to the west front, conservation of decayed stonework to south aisle windows, works to an access stairway, repair of cracking to an internal clerestory window and modification of internal lighting. Repairs to the upper parts of the west front were undertaken by a specialist roped-access conservation team, with still and video recording of the fabric before and after repair allowing for confirmation and certification of scheduled works. Use of roped-access operatives for this delicate work meant that scaffolding could be limited to a single lift at the base of the elevation, which provided a safe route for the congregation and visitors into the church as well as giving a stable working platform for replacement of decayed Barnack mouldings. Roped-access was also used as the preferred method of working for changes to internal lighting at clerestorey and gallery levels. The repair and conservation of heritage assets requires meticulous planning, management and implementation, and the use of skilled roped-access operatives offers advantages in certain situations over more familiar approaches.